Fairy tales continue to enthrall listeners of all ages for generations with their captivating stories and valuable morals. There is still a thing or two you can learn from our heroine Goldilocks, so let us take you on a fascinating journey. … not long ago there was a curious, kind-hearted and intelligent girl — named Goldilocks, who graduated from the University of BIM with the highest honors. After many hours of studying and hard work at the Future of BIM Architecture office, she decided to go camping as a reward of her many achievements. Not a minute after she announced her holiday, a tiny problem arose. The BIM manager of the company requested an up-to-date financial report for her latest project before she went on her adventure. Many would probably ‘’Huff’ and ‘Argh’ with irritation, but not our always-so-curious and savvy Goldilocks. With a few clicks in her 3D Revit® model, she extracted the financial report with her newest Autodesk plugin addiction — Xinaps Financial Simulator™. The plugin was a dream come true as it assisted Goldilocks during the initial cost estimations of her projects while being fully integrated and automatically synchronized with the latest drawings and data input in Revit®. Receiving generous praises about her building design and report, Goldilocks went home exhilarated about the upcoming trip. She ensured she had all the belongings she needed, before heading to the AEC camping site on an early Saturday morning. Goldilocks was well-known in the Future of BIM Architecture office as an inquisitive and innovative architect, who embraces adventures. However, in her rush to enjoy the companionship of like-minded professionals in the AEC camping site, she found herself lost in the woods. She wandered for hours until the last rays of the sunset touched the crowns of the trees around her. To her relief, she came across a cottage. Goldilocks knocked a few times, but when no one answered, she walked right in. A short memory lane led her to the times when her mother explained that one should never speak to strangers or enter unknown houses. However, her exhaustion and fear of the dark woods had the final word and they had thrown all these precautions through the window. The cottage was a treasure in the depths of the woods — a perfect mixture of traditional and modern style. After satisfying her hunger with some tasty and warm soup, Goldilocks went upstairs, where she found four beds. There was an enormous king’s bed, a double one, a middle size bed and a tiny little bed. By now she was feeling rather tired, so she climbed into the king’s bed and lay down. The big bed was very hard and far too big. She sighed with laughter as it reminded her of Level 0 BIM — general, not collaborative to her needs. A flashback to her introduction of BIM went through her mind. There had been times when architects indeed had believed that 2D CAD drafting existed for the main reason of product information. Times when the architects were doing all the output and distribution of designs on paper. She remembered how she had run across town to copy shops to print her drawings for her final examples. Desperate times indeed. She sighed with laughter as it reminded her of Level 0 BIM — general, not collaborative to her needs. A flashback to her introduction of BIM went through her mind. There had been times when architects indeed had believed that 2D CAD drafting had only been utilized for the main reason of product information. Times when all the output and distribution of designs had been done on paper. She remembered how she had run across town to copy shops to print her drawings for her final examples. Desperate times indeed. She decided that the king-sized bed, as well as the Level 0 BIM, were not something she enjoyed, so she climbed to the double-sized bed on the side. This one was surely more acceptable with its softer mattress just as the Level 1 BIM, which had brought more precise and complex drawings in the AEC industry. The same thrill went through her body as the one when she had started her career in the Future of BIM Architecture practice. The mixture of 3D CAD for concept work and the 2D for drafting had been something exciting back then when Level 1 BIM had appeared. Electronic sharing of data had been carried out from a common data environment (CDE) via the contractor, but collaboration had still been rough and inefficient. Motivated to have a night of sweet dreams in a comfortable bed, Goldilocks moved to the middle-sized bed, which felt as soft as sleeping on a cloud just as Level 2 BIM had brought significant innovation and development in the AEC industry. Now for a few years, she had been using the BIM software Revit®, which had brought collaboration to life with its additional plugins and interactive environment. All parties involved in a project were now able to use 3D CAD while working with multiple models. This elevated the information exchange to new levels of sharing and collaborating through a common file format, which enabled architectural practices to combine that data with their own and create an integrated and coherent BIM model. 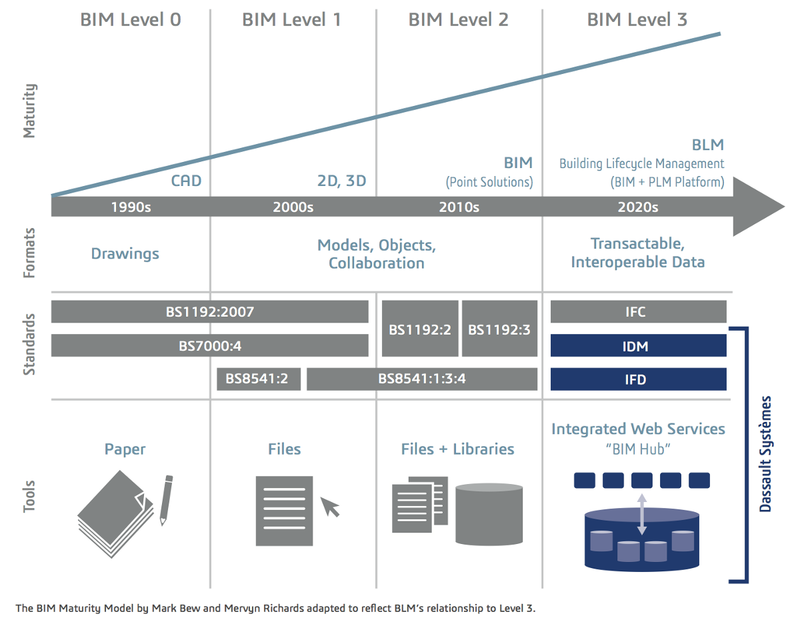 To architects’ greatest satisfaction, the Level 2 BIM was now set as a minimum standard by governments on a global scale, which had aimed to ensure the build quality, sustainability, and durability of buildings. This bed was extremely comfortable, but there was this sleepy unconscious voice in Goldilocks’ mind, which was whispering that the tiny little bed would bring even more content, so in her half-sleepy state she climbed in it. And it was the description of heaven — neither too hard or big nor too soft or small. In fact, it felt just right, all cosy and warm and in no time at all Goldilocks fell fast asleep. She dreamt of the future where Level 3 BIM would bring full collaboration between all disciplines by using a singular, shared project model, held by a centralized repository. It would solve so many problems such as copyright, liability and reduce risk by efficient and effective building lifecycle management where data would be transactable and interoperable. This would surely be the holy grail of BIM levels. Goldilocks slept with a smile on her face and once the first rays of the sunrise kissed her face, she awoke. She knew she could not ever express her gratitude to the people, who owned the cottage with a simple ‘’thank you’’ note, but still wrote one and baked some cookies, which she left on the kitchen table. Goldilocks would ever be thankful for the comfort and innovative ideas the tiny little bed brought for Level 3 BIM. She couldn’t wait to share them with her friends once she got to the AEC camping site. 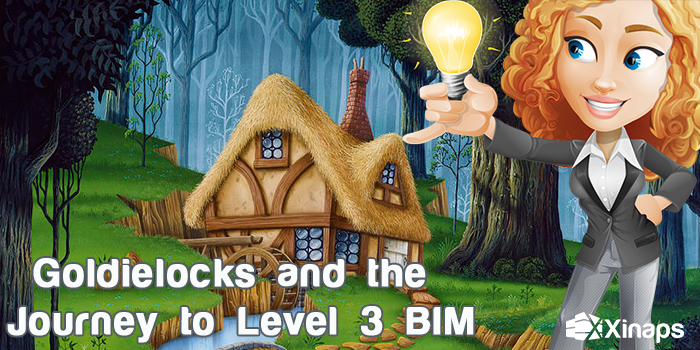 And so Goldilocks started her daring journey towards the yearned Level 3 BIM. Would you like to join her? Want to know more about us and our products? Take a few minutes to look at our website and our corporate video.